Developer claims to turn iOS device into a "professional camera"
A new iPhone and iPad app claims to be able to turn the iOS devices into professional-level cameras. In reality, the Big Lens app works by editing pictures after they have been taken, by changing periphery blur levels and adjusting the background to create a bokeh effect. 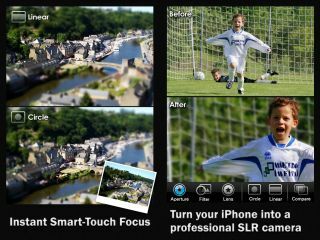 According to the developer, Reallusion, a number of powerful filter effects help to create "professional-looking photos". The app claims to be able to mimic DSLR photography in a variety of ways. The Smart Focus system enables you to use your finger tips to focus images using geometric shapes, while a lasso tool enables you to autofocus on a target, or you can choose an advanced mode to manually define a focus area. Aperture Control changes the level of blur in out-of-focus areas, while the app also includes nine filters to turn out-of-focus bokeh into different shapes such as hearts and stars. Over 18 filters are included in the app, providing users with the ability to enhance colour, increase contrast or add Lomo-style effects to pictures. Instant focus and blur tools enable the user to instantly modify, focus and blur an area. Simple gestures can be used to enhance and retouch focal areas. The Big Lens app is available for 69p from the App store.